Last week the Macsween Haggis team shared some of their favourite haggis lunch recipes on Facebook. Their haggis quesadillas looked delicious and the cheese and haggis toasties were a triumph. Now the Macsween Haggis team know their haggis, but as haggis aficionados ourselves, could we do any better? 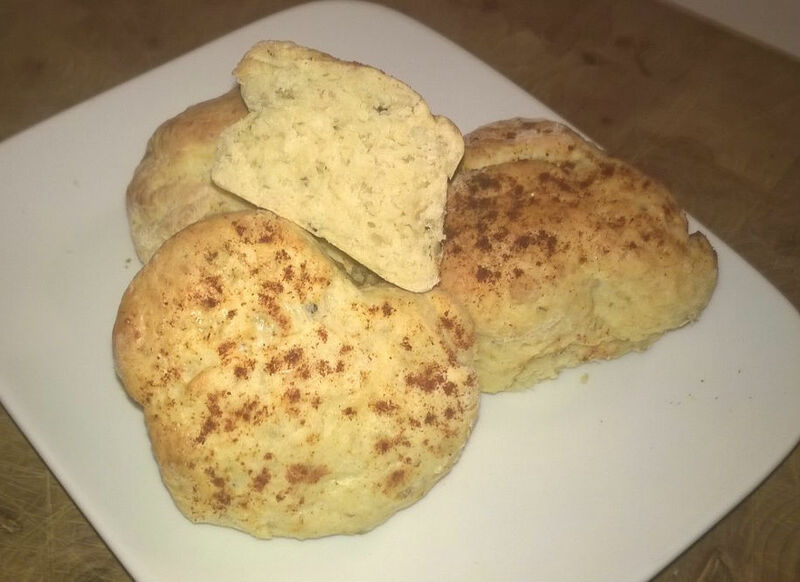 Haggis and Cheese scones anyone? Scones are a baking mainstay for us. Quick to mix and always forgiving of the wild combinations tumbling out of the fridge, they are always great for lunch. But haggis? Would this work? Inspired by Ruth’s Makey Cakey blog we decided to give it a go. After all, these little babies would be prefect for our lunchboxes. And here they are. They took only 15 minutes to prepare, ten minutes to bake, and tasted delicious. The trick with this recipe is to add the haggis once you’ve created breadcrumbs with your flour and butter. The canny among you will also notice there is less butter in this recipe than you’d usually expect in a cheese scone recipe. The haggis adds its own natural binding to the ingredients. Preheat oven to 200C fan (fan or 220C conventional) and grease your baking trays. Spoon the baking powder into the flour. Add the butter to the flour and either by hand or in a food processor mix the ingredients together until they have the look and feel of breadcrumbs. Add the haggis and stir or whiz it together again. Stir in the grated cheese. Then make a well in the centre of the mix and add the beaten eggs and half of the milk. Mix with a knife until the mixture forms a sticky but firm dough. Add more of the milk if required. Bring the mixture together with your hands and tip the dough out onto a floured worktop. Roll out until about 1.5cm thick and cut into any shape your fancy. Rounds are more traditional but we chose hearts. Brush with a little more milk and sprinkle with paprika. Bake for about 10 minutes until risen and golden, then cool on a wire rack. We ate these for lunch fresh from the oven with some scotch broth soup, but they go just as well with scrambled or poached eggs too. So how do you serve haggis for your lunch?